In my last post I mentioned the first major artifact in the long story of the Christian Reformed Church’s Psalter Hymnals, leading up to the one the URC uses today and the one it hopes to produce in the future. 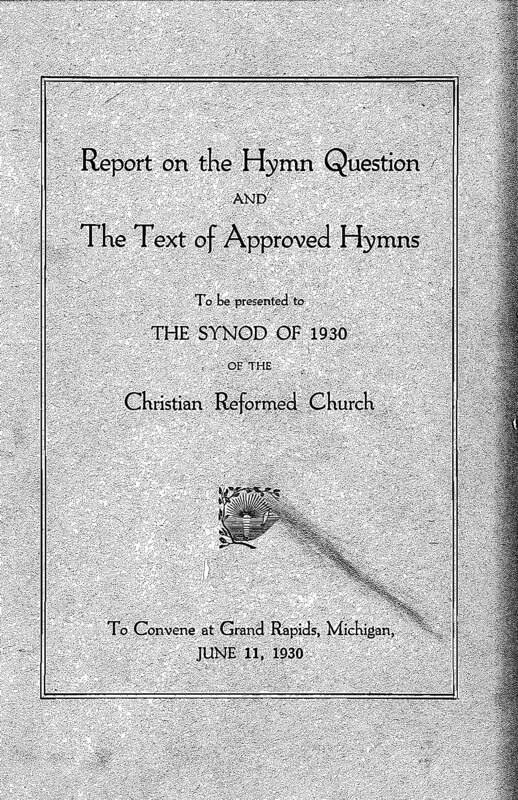 That document is the “Report on the Hymn Question” submitted by the first Psalter Hymnal Committee to the 1930 synod of the CRC. While the “Report on the Hymn Question” contains the first formal justification and discussion of the reasons for a Psalter Hymnal, it was not the first step in the journey towards a hybrid psalm- and hymn-book. That first step began with an overture from Classis Grand Rapids East in 1928. Before 1928, as the foreword to the 1934 Psalter Hymnal notes, the Christian Reformed Church sang “practically nothing but Psalms in public worship.” This was an easy tradition to justify as long as CRC congregations worshiped in Dutch and sang from Dutch psalters. As churches (and especially young church members) began to transition to worship in the English language, however, the matter became stickier. 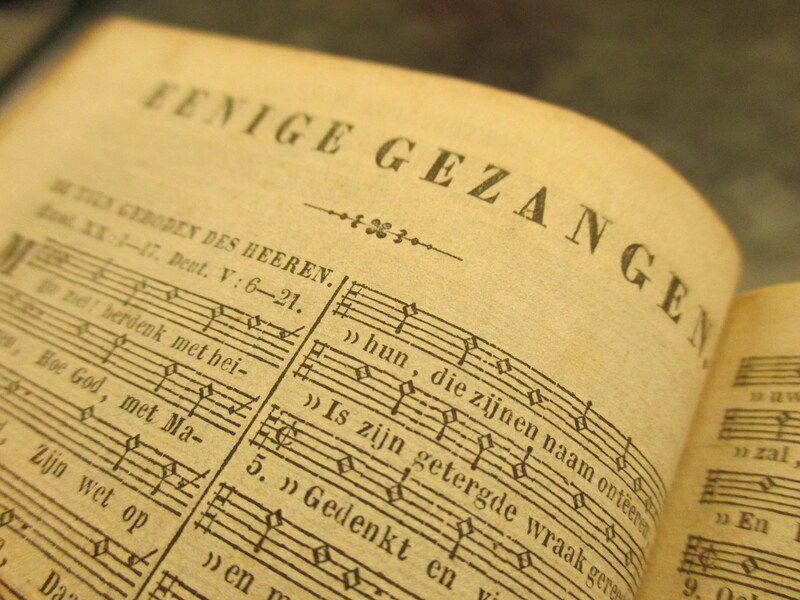 Hymns began to be used “in religious gatherings outside of public worship,” and pressure mounted to incorporate more hymns into worship than the dozen or so standard offerings included in the back of the Dutch psalters. In 1928 came the first definitive call for action, as the CRC’s synod faced overtures from three of its fifteen classes arguing for the inclusion of hymns, two classes and a consistory arguing against the inclusion of hymns, and four classes requesting the appointment of a committee to study the matter further. Among these overtures, two stand out as the longest and most thorough: the one from Classis Grand Rapids East in favor of hymns, and the one from Classis Zeeland against hymns. I’ve transcribed the text of the GR East overture and done a little bit of the translation work here. The Zeeland overture is among the additional communications posted here. I encourage you to read through Classis Grand Rapids East’s overture yourself and examine their reasoning. If I had to summarize their arguments, it would be as follows: Hymns should be incorporated into worship because (1) the singing of hymns is not forbidden in Scripture, and (2) there is a need for hymns in the churches. The classis’s additional points are qualifiers: i.e. that hymns must be doctrinally sound and must not dominate the church’s worship. While I’m not here to argue against using hymns in worship, some of the particulars of Classis Grand Rapids East’s reasoning trouble me. First, the classis all but ignores the regulative principle of worship (what is not commanded is forbidden), which we’ve discussed elsewhere on URC Psalmody. They argue for the inclusion of hymns by calling into question any biblical command for psalms or hymns in worship. In regard to Paul’s exhortations to the Ephesians and Colossians to “sing psalms and hymns and spiritual songs,” they claim to have “no definite certainty whether these passages refer to our singing in public worship.” (Yet they later seem quite sure that I Timothy 3:16 quotes a “well-known hymn of praise” in the early church.) “Nor is the singing of spiritual songs or hymns expressly forbidden in God’s Word,” the classis adds, falling back on the normative principle of worship for justification (what is not forbidden is permissible). This alarms me. If we are to sing hymns in worship, we should possess at least a fair amount of certainty that God has commanded their use. The classis seems to lack that conviction, yet continues their case for hymn-singing unconcerned. Second, the classis argues for hymn-singing by attempting to point out insufficiencies in the psalms: that they fail to reflect the “clearer revelation” and “fulfillment” of the New Testament. Unfortunately, the Trinity is a poorly chosen example. Indeed, the Book of Psalms contains some of the clearest indications of the Trinity in the entire Old Testament, if not all of Scripture. Think of Psalm 2: “You are my Son; today I have begotten you.” Or Psalm 104: “When you send forth your Spirit, they are created.” Or Psalm 110: “The LORD says to my Lord: ‘Sit at my right hand, until I make your enemies your footstool.’” Indeed, the fact that so many of the psalms “employ the past tense, the tense of fulfillment,” seems to prove the lasting value of the Psalter rather than an inherent need for New Testament-inspired hymns. The psalms come with the light of fulfillment built in! Again, valid arguments can be made for the inclusion of uninspired hymns alongside psalms in worship, songs that reflect the message of the whole Bible. But we must not base those arguments for hymns on failings in the psalms. If we confess that God gave us the psalms to use in worship, we cannot also claim that they are insufficient for the church’s needs. We cannot affirm the Holy Spirit’s inspiration of the Old Testament while also dismissing it as somehow sub-Christian. Finally, the classis defends the need for hymns by mentioning their “directness” and “heart-appeal” that speak to the “younger generation,” whereas understanding the psalms requires “a rather extensive exegesis.” (Don’t these terms call to mind more recent arguments for praise choruses?) This is not only a ridiculous misrepresentation—which is more direct and heartfelt, the sappy “I Surrender All” or the raw emotions of Psalm 130?—but it also utterly neglects the role of the psalms as a teaching tool. In fact, many psalms address the “younger generation” directly: “Come, O children, listen to me; I will teach you the fear of the LORD” (Psalm 34:11); “We will not hide them from our children, but tell to the coming generation the glorious deeds of the LORD, and his might, and the wonders that he has done” (Psalm 78:4). Hymns are constrained by time, place, and cultural context; the psalms are for every generation. Readers, what do you think? Are there particular areas in which you agree or disagree with Classis Grand Rapids East’s case for hymn-singing? Do you think this makes an adequate case for hymn-singing in the churches? How would you structure an argument for a Psalter Hymnal? Next time, Lord willing, we’ll delve into the overture against hymn-singing from Classis Zeeland. It’s a fascinating time in the church’s history. That statement may sound a little naïve. “Has your head been buried in the sand this past year? Or even this past week?” you might be wondering. Between the aftermath of racism-motivated shootings, turmoil over recent Supreme Court decisions, concerns about tax-exempt status and religious freedom going forward, and the continuing liberalization of mainstream Christianity, it certainly doesn’t seem like the church is in prime condition. But don’t let the news headlines faze you. If anything, we are merely re-entering the kind of atmosphere in which the church thrives, and in which it has thrived since the time of the apostles. “In the world you will have tribulation,” promised Jesus (John 16:33). Maybe we in the West haven’t been confronted with the full truth of this statement for the last few centuries, in which the surrounding culture has been overwhelmingly favorable to Christianity. Actually, I think there is abundant evidence the church of Jesus Christ has atrophied in such an environment, with liberalism and loose “cultural Christianity” as two likely byproducts. That’s why I say it’s a fascinating time in the church’s history: because, particularly in the Presbyterian and Reformed tradition, I find myself surrounded by encouraging signs of this reinvigoration. The one that pertains to us the most at URC Psalmody, of course, is a renewed concern for Biblical, God-glorifying worship—particularly through psalm-singing. Now, combining a fresh interest in psalmody with the reconsideration of assumptions from the church’s past leads me to an interesting question: How did our worship come to be this way? I’m not talking about the structure of Reformed worship services in general, like our series last summer. Here I’m thinking particularly about the unique combination of songs in the URCNA’s heritage of worship: not psalms only, not hymns mixed with psalms, but distinct categories of psalms and hymns—a Psalter Hymnal. Although this combination has been a familiar part of our worship since the publication of the Christian Reformed Church’s first Psalter Hymnal more than eighty years ago, it’s not a common sight in the broader church. There are psalters, such as the RPCNA’s Book of Psalms for Worship (2009). There are hymnals, such as Word’s Celebration Hymnal (1997). But songbooks that devote separate sections to both psalms and hymns are hard to find. The OPC and PCA’s current Trinity Hymnal (1990) includes a significant number of psalm settings, but they are merely interspersed among the hymns. The PCUSA’s Presbyterian Hymnal (1990) has a separate psalm section, but it is incomplete. Even the new hymnal of the CRC and RCA, Lift Up Your Hearts (2014), merges psalms and hymns (though these denominations separately published Psalms for All Seasons, a complete psalter). My point is that it is a little odd, both in theory and in practice, to sing both psalms and hymns in worship, yet still insist on distinguishing between the two. But that’s exactly the position held by the URCNA: “The 150 Psalms shall have the principal place in the singing of the churches,” yet sound hymns “may be sung” if approved by the Consistory (Church Order Art. 39). Moreover, the fact that the new URC/OPC Psalter Hymnal will (we expect) continue to separate psalm settings from hymns supports this distinction. Our churches’ position leads to an unusual conclusion: Psalms and hymns are equal as regards suitability for worship, but unequal as regards their essence. The debate over the theological basis for this conclusion will have to wait for another day. For now, though, I want to probe into its historical origins. A useful starting point is the background behind the publication of the CRC’s first “red” Psalter Hymnal in 1934. As the CRC had previously adhered to a practice of almost-exclusive psalmody, the incorporation of hymn-singing was a significant shift and merited a 133-page booklet from the Psalter Hymnal Committee in explanation. That booklet is available for download from the CRC’s online archives (in English, fortunately), and I’ll start by commenting on its most relevant portions. Interestingly, this booklet also includes the textual changes made to the hymns included in the first Psalter Hymnal—many of which have been passed down to us in the current “blue book.” Studying this Psalter Hymnal Committee Report may not provide a complete answer to our historical questions, but as I said, it is a starting point. Does this summer series sound boring? If you’ve read this far, hopefully you don’t think so. Even though rehashing synodical decisions from the 1930’s sounds pretty irrelevant, it should be obvious why the question of a Psalter Hymnal remains important today. After all, the pursuit of Biblical, God-glorifying worship should never stop—especially not at a time in the church’s history as fascinating as now.